Fearing the actions of Superman left unchecked, Batman takes on Superman, while the world wrestles with what kind of a hero the world really needs. With Batman and Superman fighting each other, a new threat emerges – Doomsday created by Lex Luthor. It’s up to Superman and Batman to set aside their difference along with Wonder Woman to stop Lex Luthor and Doomsday from destroying Metropolis. 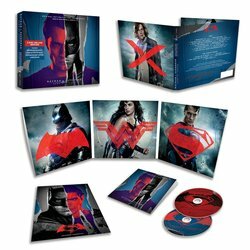 The soundtrack Batman v Superman: Dawn of Justice is a collaborative effort by film composers Hans Zimmer and Junkie XL (aka Tom Holkenborg). Available digitally, on CD, 2-disc deluxe CD, and on Limited Edition 3-disc deluxe vinyl, the album is now available. The 2-CD deluxe package features over 90 minutes of music, five bonus tracks, an exclusive fold-out poster and liner notes from the composers. “Junkie XL is an incredibly insightful film composer. It was a perfect idea for us to work together on the ‘Batman v Superman’ score,” explained Academy-Award-winning composer Zimmer. To be in with a chance of winning one of 3 Batman v Superman: Dawn of Justice deluxe soundtracks, just answer the question below.